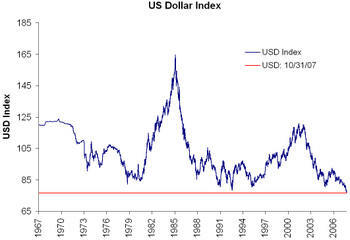 During a continued downward move (-10.5% YoY) the US Dollar index has sunk to an all-time low. As many analysts and article have pointed out, this should help sales of American goods overseas. That's true, but my investments in the US are automatically down by more than 10% since I converted EUR to USD, to purchase stocks. Anyway, sooner or later, the USD will recover. The USD will go so low that foreign governments will stop buying our Treasuries. Then we will be USC.